Def Leppard and KISS continued the Summer Tour 2014 last night in Austin, TX with a 14 song set played. 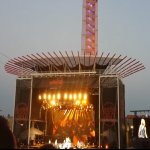 The band played the regular 75 minute set at Austin360 Amphitheater. The show started with the live snippet of 'Won't Get Fooled Again'. 'Rocket' was added back into the set after two shows out. This was the first time the band had performed in this brand new venue. This show/date marks exactly 32 years since Phil Collen joined the band in 1982. The next show takes place on 13th July in Dallas, TX.